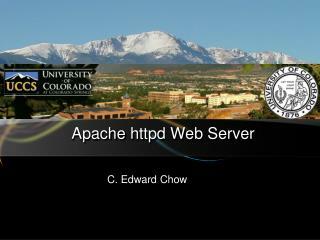 Apache httpd Web Server. 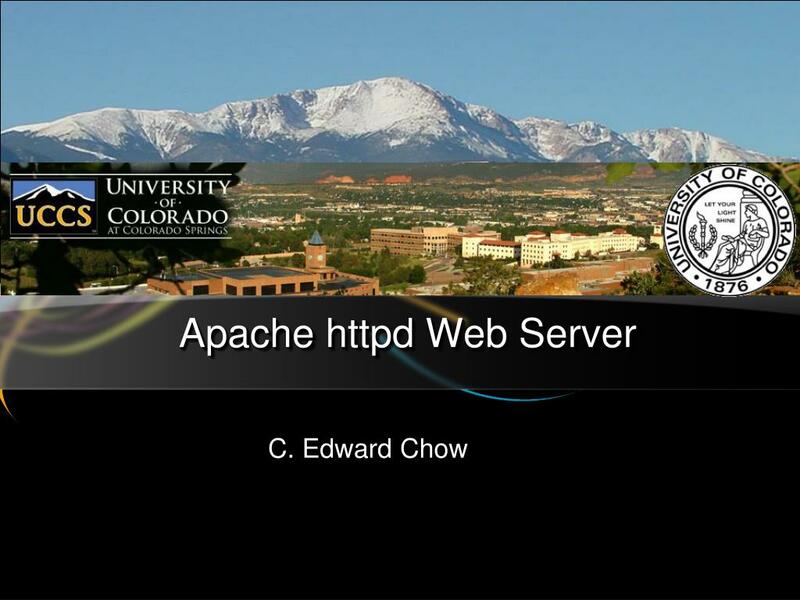 C. Edward Chow. 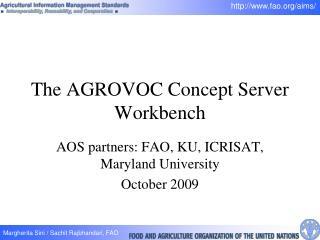 Outline of the Talk. 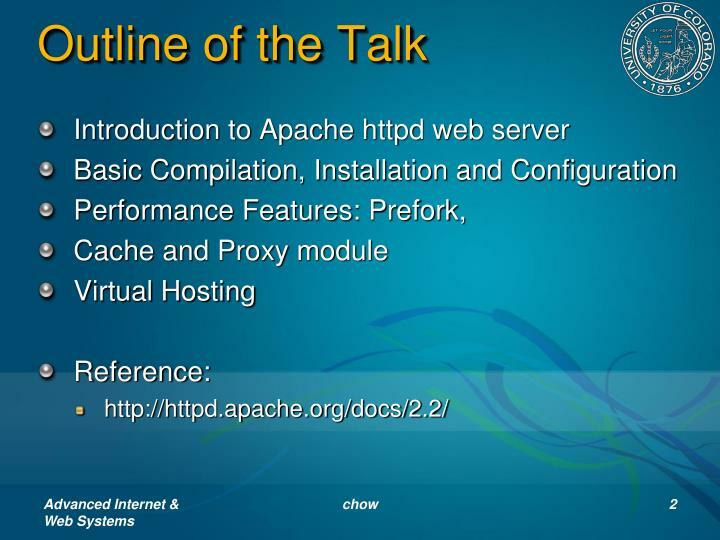 Introduction to Apache httpd web server Basic Compilation, Installation and Configuration Performance Features: Prefork, Cache and Proxy module Virtual Hosting Reference: http://httpd.apache.org/docs/2.2/. 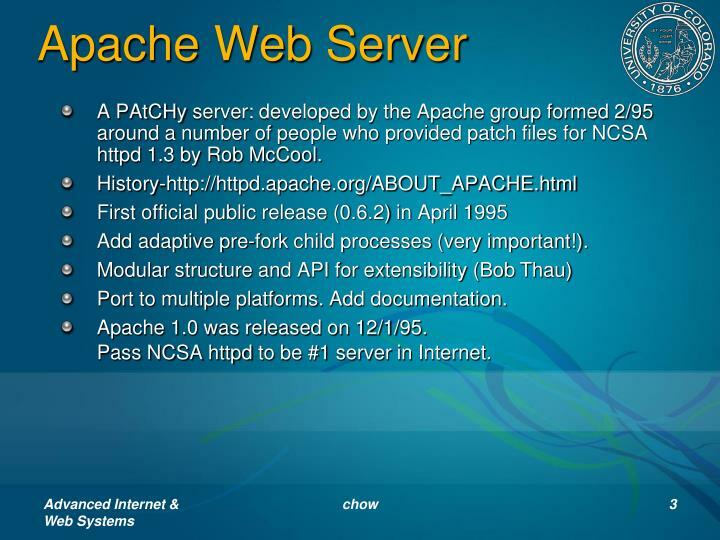 A PAtCHy server: developed by the Apache group formed 2/95 around a number of people who provided patch files for NCSA httpd 1.3 by Rob McCool. Add adaptive pre-fork child processes (very important!). 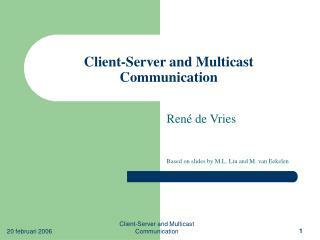 Port to multiple platforms. Add documentation. 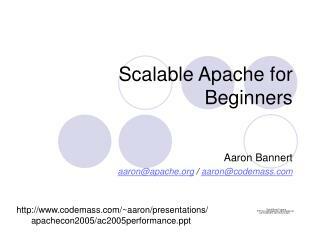 Apache 1.0 was released on 12/1/95.Pass NCSA httpd to be #1 server in Internet. 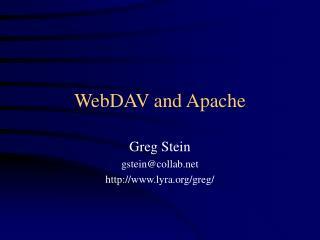 The current stable release is Apache 2.2.17. 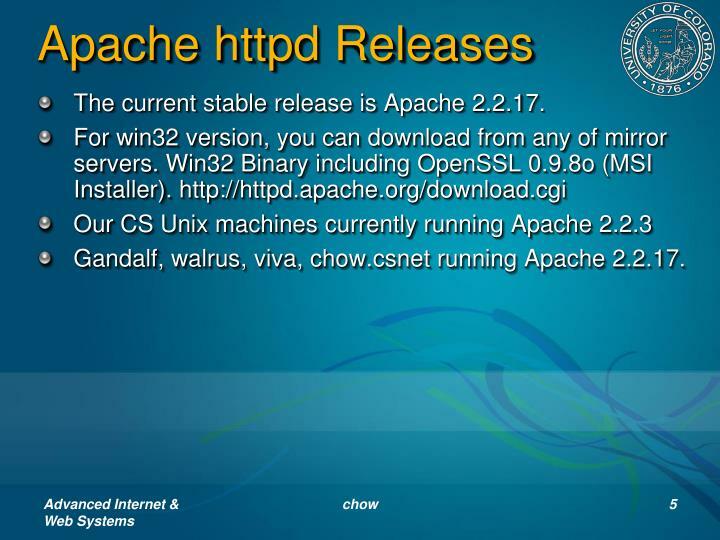 Gandalf, walrus, viva, chow.csnet running Apache 2.2.17. Customized for the needs of the particular site. prefork  stability or compatibility with older software. 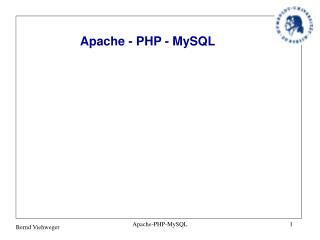 Production quality disk caching and memory caching. Output filter chain called dynamically configured. 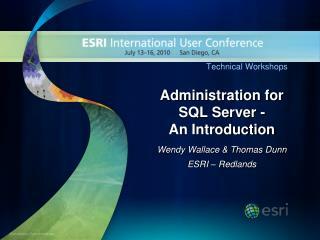 Filters can be conditionally inserted based on Request/Response header or env variables. 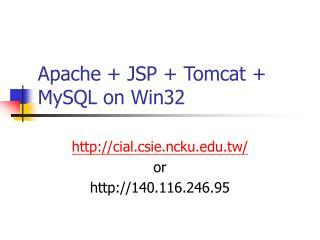 Jserv Support for Apache Tomcat. 3 load balancer scheduler algorithms: Weighted Request Counting, Weighted Traffic (byte) Counting, and Pending Request Counting. 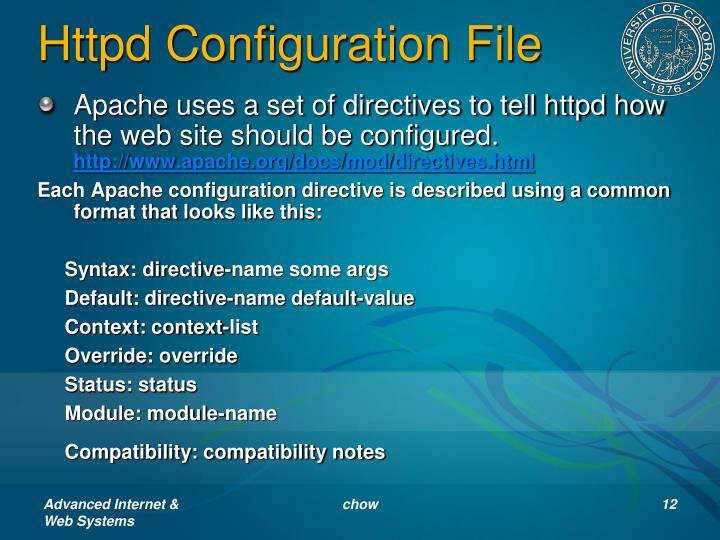 Here is the command we used to compile the htttpd with proxy and cache modules we need. 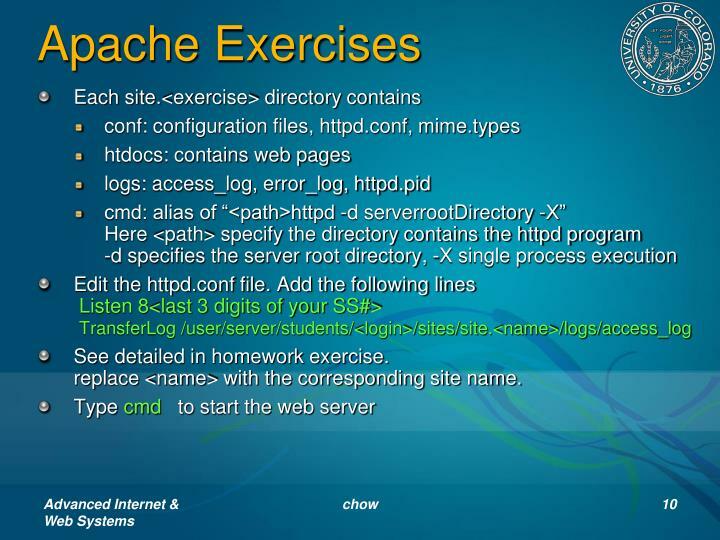 See detailed in homework exercise.replace <name> with the corresponding site name. 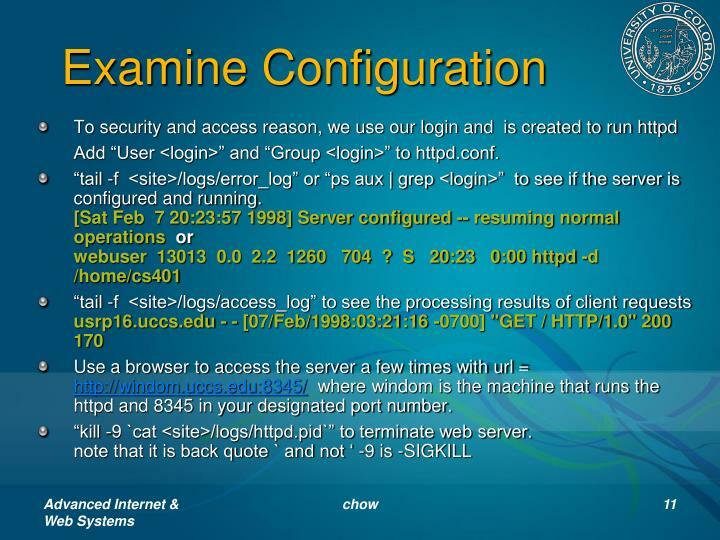 Add “User <login>” and “Group <login>” to httpd.conf. 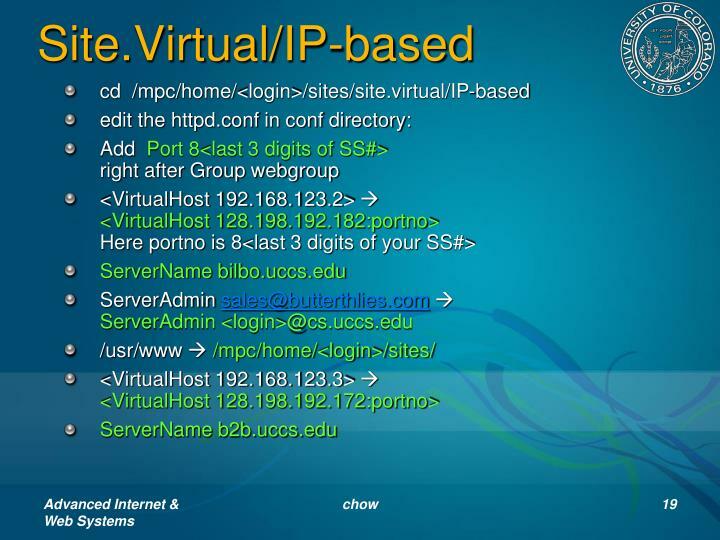 Use a browser to access the server a few times with url = http://windom.uccs.edu:8345/ where windom is the machine that runs the httpd and 8345 in your designated port number. 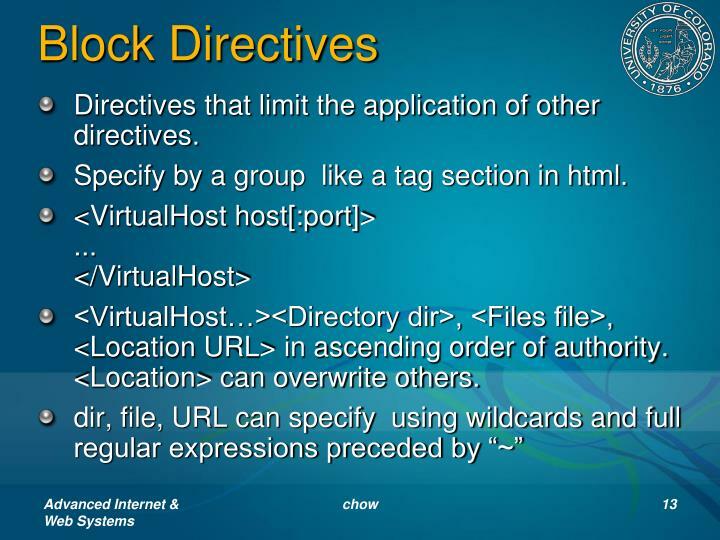 Directives that limit the application of other directives. 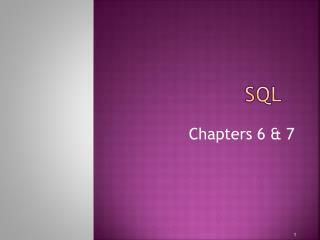 Specify by a group like a tag section in html. 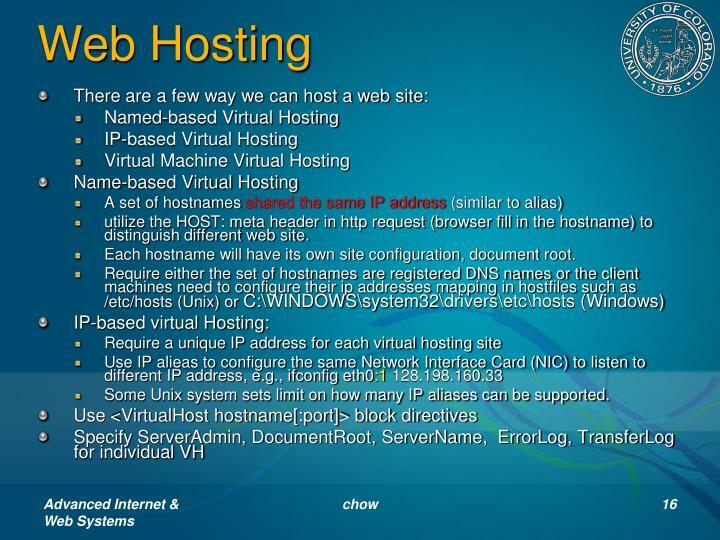 <VirtualHost…><Directory dir>, <Files file>, <Location URL> in ascending order of authority. <Location> can overwrite others. 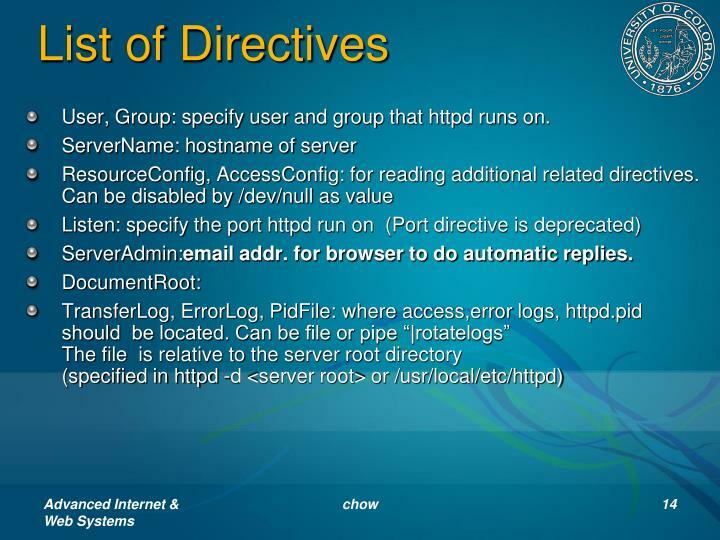 User, Group: specify user and group that httpd runs on. ServerAdmin:email addr. for browser to do automatic replies. KeepAliveTimeout <n>(15): wait for the next request for n seconds before terminate the connections. Timeout <n>(300): max. 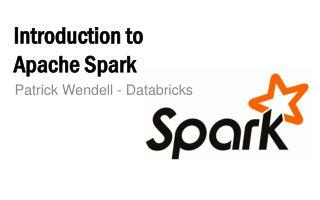 time in sec for a block data. HostNameLookups [on|off|double](off): do reverse DNS lookup for logging the domain name of the request. MaxClients <n>(256): the limit of # of simultaneous requests (hence the # of child processes). 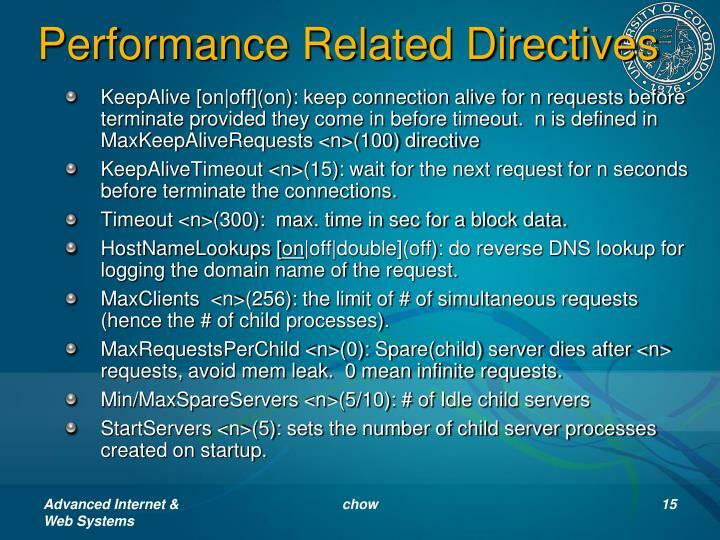 MaxRequestsPerChild <n>(0): Spare(child) server dies after <n> requests, avoid mem leak. 0 mean infinite requests. StartServers <n>(5): sets the number of child server processes created on startup. utilize the HOST: meta header in http request (browser fill in the hostname) to distinguish different web site. 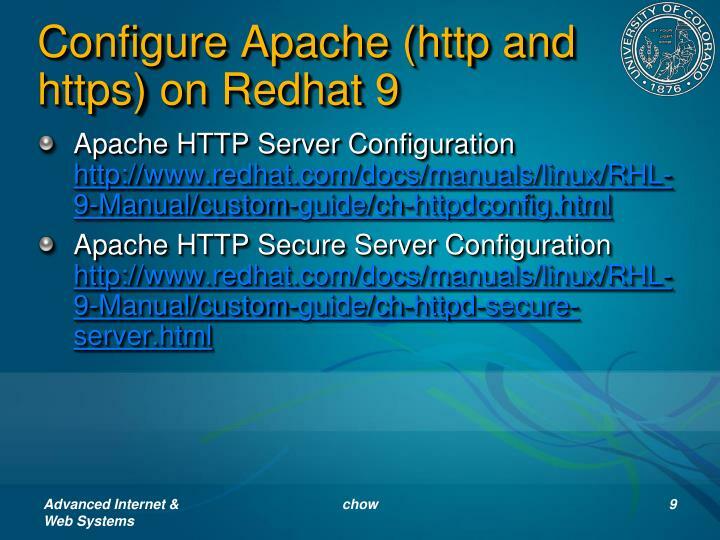 Each hostname will have its own site configuration, document root. Some Unix system sets limit on how many IP aliases can be supported. 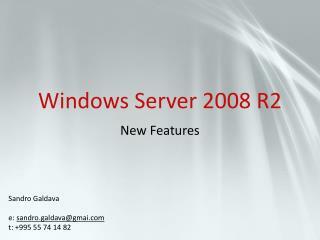 With Virtual Machine (VMWare/VPC). 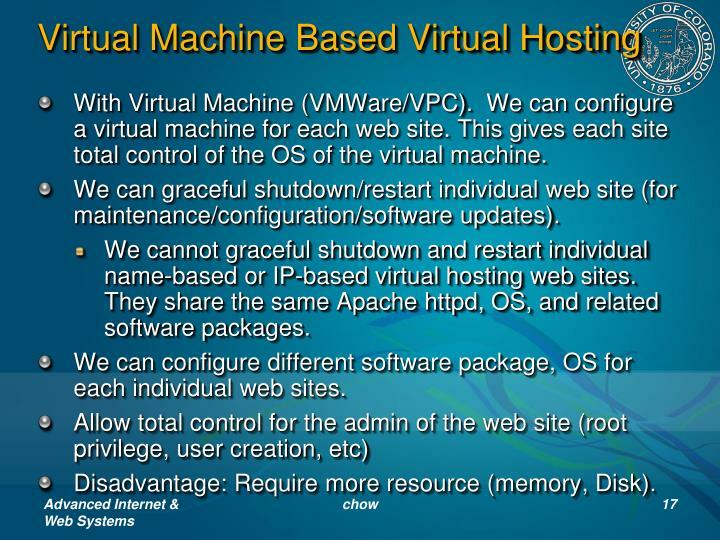 We can configure a virtual machine for each web site. 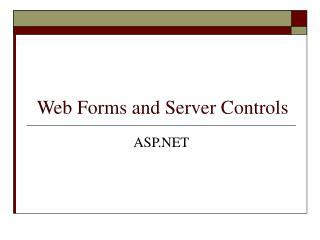 This gives each site total control of the OS of the virtual machine. 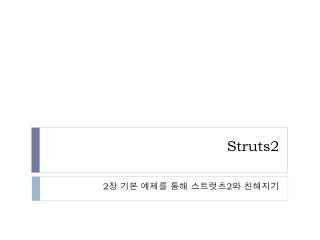 We can graceful shutdown/restart individual web site (for maintenance/configuration/software updates). 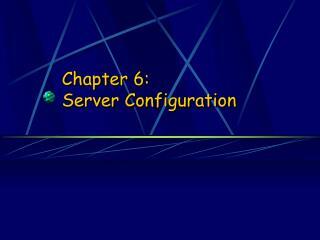 We cannot graceful shutdown and restart individual name-based or IP-based virtual hosting web sites. 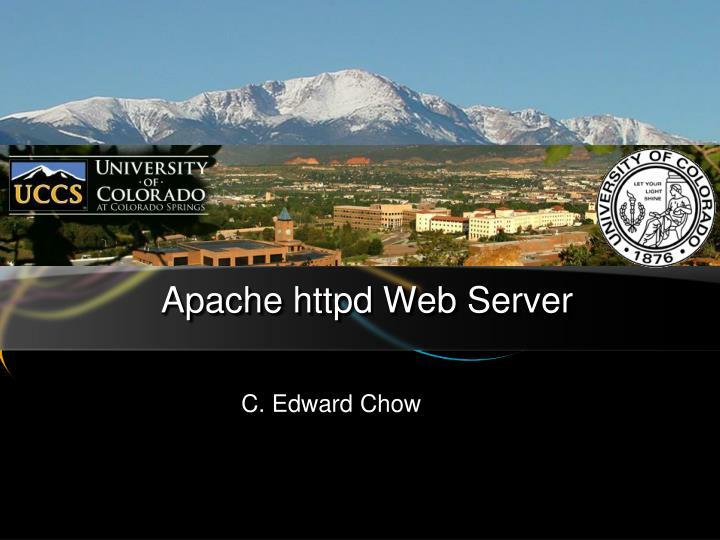 They share the same Apache httpd, OS, and related software packages. 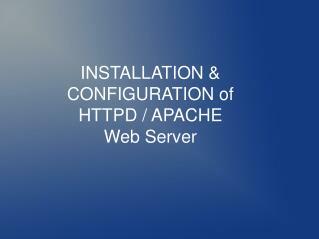 We can configure different software package, OS for each individual web sites. Disadvantage: Require more resource (memory, Disk). 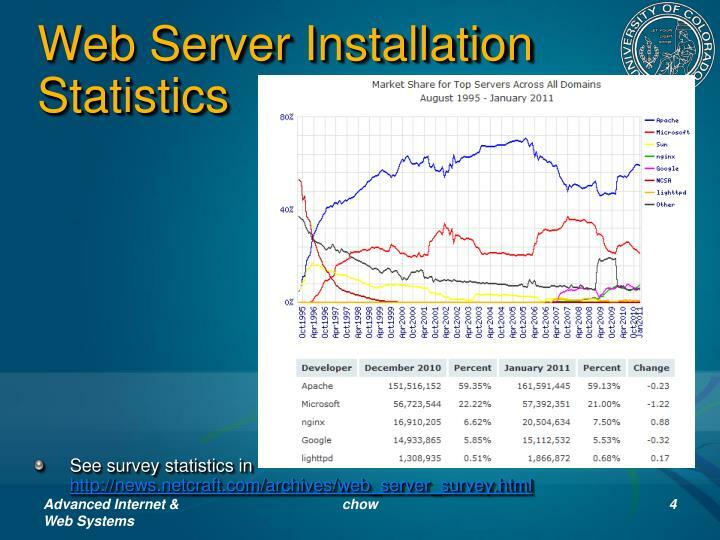 Go to start virtual hosting. 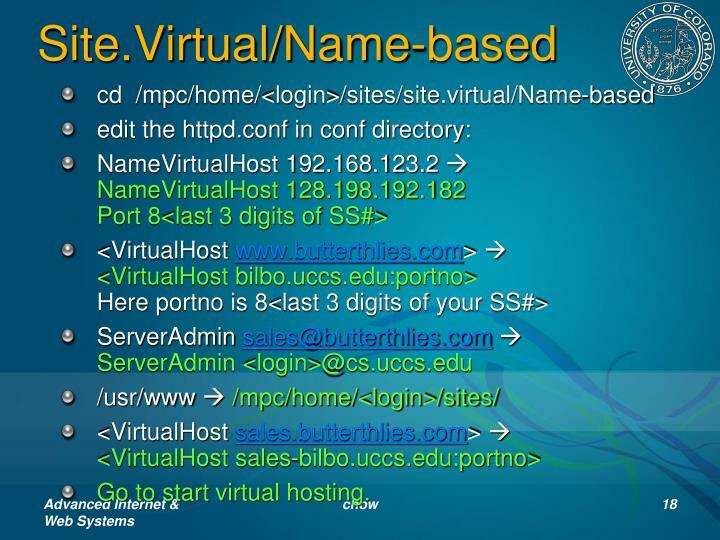 We can mix Name-based with IP-based virtual hosting. 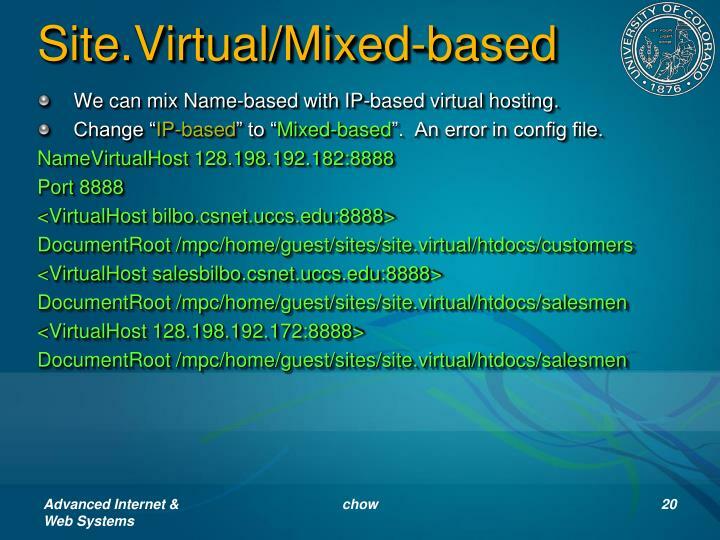 Change “IP-based” to “Mixed-based”. An error in config file. 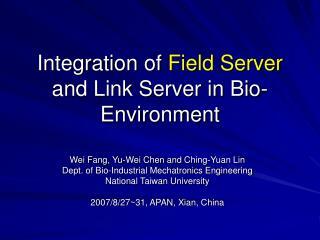 Can use one IP address to test many sites. 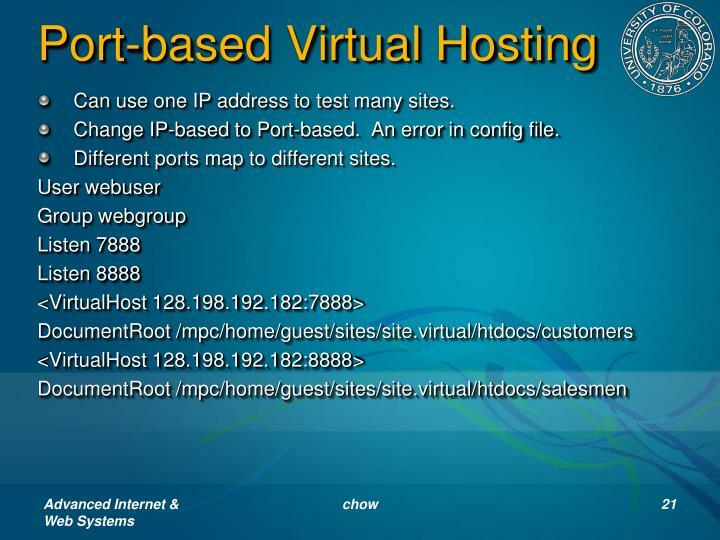 Change IP-based to Port-based. An error in config file. Different ports map to different sites. 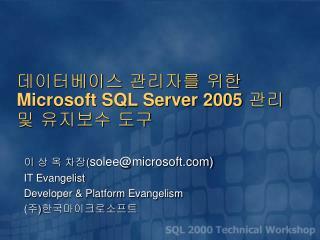 데이터베이스 관리자를 위한 Microsoft SQL Server 2005 관리 및 유지보수 도구 -. 이 상 옥 차장 ( solee@microsoft.com) it evangelist developer &amp; platform evangelism ( 주 ) 한국마이크로소프트. 목차. 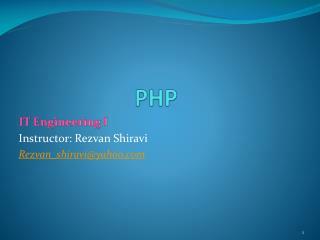 PHP -. 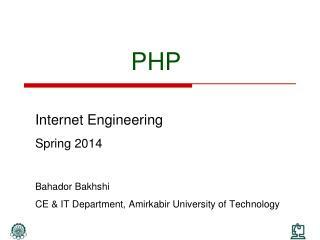 internet engineering spring 2014 bahador bakhshi ce &amp; it department, amirkabir university of technology. questions. 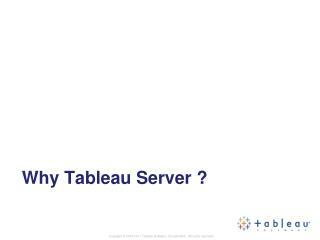 q7) how does server process client’s requests? 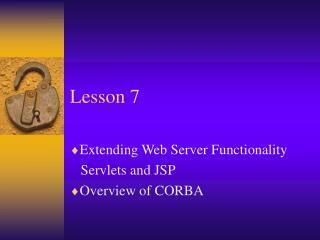 q7.1) how to code in server side? 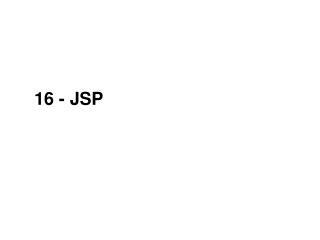 q7.2) which language?